Valentine’s day in St. Augustine is charming and full of possibilities. People of all ages and walks of life enjoy giving each other gifts and going the extra mile to prove their love. If you ask visitors and locals alike, St. Augustine is the place to celebrate this special occasion. You can roam around the historic district or just have a nice romantic dinner – there’s something for everyone! Want to start with a local favorite? Take a visit to a Love Tree! How about a scavenger hunt through St. Augustine to find all the love trees locations? ‘What is a love tree?’ you might ask. It’s when two trees are entwined with each other, and not being able to be separated them or they will die. People say that if you kiss the love of your life underneath the tree, your love will be everlasting. So, come have a nice quiet walk with your soulmate and have a kiss under one of the trees. Includes admission to the property for up to 1 hour. Use of building and facilities. Legend of the Love Tree souvenir photo. 20% of items in the gift shop. Includes wedding venue for up to 30 people with use of Love Tree Cottage Garden. The building and facilities are available for use. Refreshments are made available to wedding guests (including canned soft drinks, sweet and unsweetened tea, and bottled water). Guests receive 20% off gift shop purchases. Make this Valentine’s Day one to remember with a photo and souvenir to remember the day. The hours are Sun: 12:00 pm – 5:00 pm, Mon – Sat: 9:00 am – 5:00 pm. Another Love Tree sighting is located at Mission Nombre de Dios Museum, located at 89 A1A Scenic and Historic Coastal Byway, St. Augustine. Experience the beauty of this old chapel and mark another Love Tree sighting off your list. Hours for the museum are Monday- Saturday 9:00 am- 5:00 pm and Sunday 12:00 pm- 4:00 pm. To make the day extra special, consider finding all the Love Trees while enjoying a romantic carriage ride through the city. Southern Carriage and Buggy Tour can help you with that. It is located at on the Bayfront Avenida Menendez, St. Augustine, FL, 32084. The hours of operation are Monday- Sunday 9:00 am- 11:30 pm. Not Interested in love tree sightings? How about a quiet picnic? Anastasia State Park is located at 300 Anastasia Park Rd. St. Augustine FL. This is the perfect venue for a beach picnic! Hours of operation are 8 am until sundown. Admission fee $8.00 per vehicle. Enjoy the beautiful view of unspoiled beaches and the nice breeze. 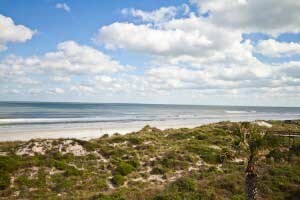 Spyglass Public Beach Access is located at 8202 A1A S, in St. Augustine and has breathtaking views. Florida has many beautiful beaches, but Spyglass Public Beach is extraordinary in it’s own right. It’s no wonder it’s one of the highest rated beach access points in the area! This is the perfect spot to take your special person to marvel at Florida’s natural life and enjoy a packed lunch. Fort Matanzas Overlook Trail is a lovely trail where you can take a nice leisurely stroll near Fort Matanza and the river, before stopping off at a picnic table or a nice scenic spot to put down your blanket and picnic among nature. Want to do a more grown up activity? How about a free tour of the St. Augustine Distillery located at 112 Riberia Street, St. Augustine, FL. Tour hours are Monday- Sunday 10:30 am- 5 pm. Experience tasty whiskey, rum, gin & vodka tastings and see how it is made on this 21 and older tour. Another place you can visit and take a tour is the San Sebastian Winery located at 157 King Street St. Augustine, FL. This tour will show you how their award winning wine is made and also give you complimentary tasting. Tour hours are: Monday – Saturday, 10 a.m. – 6 p.m. and Sunday, 11 am – 6 pm. Want to know where to get Valentine’s gift? Want to gift your special person chocolates or any other kind of sweets? Peterbrooke Chocolatier has you covered. With their chocolate gift boxes, hand-dipped fruits or pretzels, and more, there’s no better place for getting classic Valentine’s Day chocolates! Feeling a bit adventurous? Creme de la Cocoa has your covered, with a variety of flavors and styles of goodies. They also offer classes, so you can hand make your own treats with your love! For a list of their classes, look here. They are located at 299 San Marco Ave, St. Augustine, FL. Their hours of operation are Tuesday- Saturday 10:00 am- 6:00 pm. Want to have a nice meal date? Cafe Alcazar is a refined, white-tablecloth lunch option in the Lightner Museum, offering upscale New American fare. This is a lovely option to kick off the romance earlier in the day. Their highly rated dishes won’t disappoint! Located at 25 Granada Street St. Augustine, FL. Are you and your partner early risers? You don’t have to wait for the night to have a romantic meal! You can come to Aviles and have a lovely breakfast date. It’s sure to impress, as the lounge staff and it’s chefs are award winning professionals! Located at 32 Avenida Menendez, Saint Augustine, FL. Breakfast: Monday-Friday 7:00 am – 11:00 am, Saturday 7:00 am-11:00 am – Sunday 7:00 am-12:00. Lunch: Monday-Sunday 12:00 am – 4:00 pm. Dinner: Monday- Sunday 4:00 pm – 10 pm. This Valentine’s day look no further then St Augustine to have an unforgettable day of romance. Historical downtown: Historic downtown St. Augustine is a bustling area presenting tons of activity. During the day you will see the streets filled with shoppers and restaurants with amazing cuisine and enticing atmosphere. Trolleys cruise the streets providing informative and entertaining narrative tours of the historical architecture and monuments throughout the area. The evenings boast a wealth of hopping nightlife and live entertainment. Museums: There are so many to choose from! Historical monuments, forts, wax museums, and even showcases of medieval torture. The options are wide and varied, with a little something for everyone. One of our favorites is Flagler College. This facility gives a fascinating, historical tour of the former Hotel Ponce de Leon, built by Henry Flagler in 1887. The college is now home to hundreds of thriving students. Another must-see attraction is the oldest wooden schoolhouse, dating back to the 18th century. Trolleys and trains: These informative and narrative tours of the city provide information and transportation to the best destinations in town! With several designated hop-on and off stops, you can travel throughout the city and experience the best sightseeing spots and scenery St. Augustine has to offer. St. Augustine Alligator Farm and Zoological Park: Enjoy our milder climate by spending a day outside experiencing the wildlife at this amazing alligator farm. Scenic Boat Cruises: For a different perspective of St. Augustine, go for a ride on one of the many boats offering tours from the water. Enjoy a sunset cruise, a dolphin feeding tour, or even a pirate ship excursion! Fort Mose Historic State Park: When it’s time to spend a day in the sunshine, Fort Mose is a 40-acre waterfront park with picnic areas, boardwalk, kayak launch, a visitor center and an interactive museum. Fountain of Youth: No trip to St. Augustine is complete without a visit to this pet-friendly attraction. This fascinating and entertaining tour of Ponce de Leon’s Fountain of Youth will introduce you to the original site of St. Augustine, our Nation’s oldest city. You’ll even see the spring that has been claimed to be the fountain that provides restoring youth. There is so much to see and do here, you’ll want to spend the entire day. Whetstone Chocolates Tasting Tour: For a decadent change of pace, get introduced to the history and chocolate making through the Whetstone tour. Enjoy freshly made chocolate confections as you tour the facility. Yum! 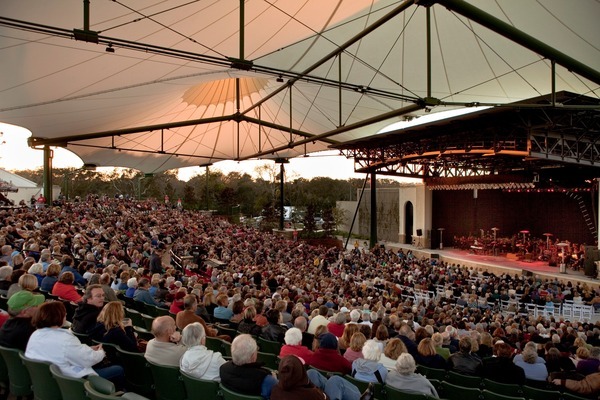 There’s so much more to enjoy in St. Augustine! We hope these ideas get you started on your journey. We’re so glad to have you here with us at Beacher’s Lodge. 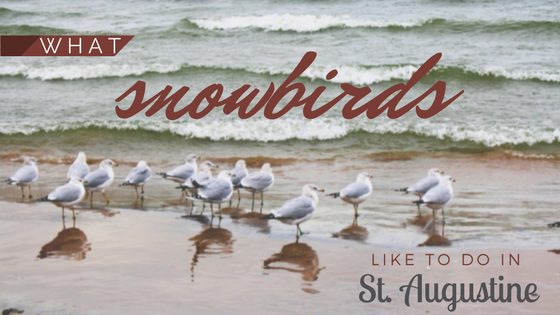 Thank you for choosing St. Augustine as your winter getaway! 1.Old Town Trolley Nights of Lights Tours and Ripley’s Red Train Tours offer a narrated, spectacular experience of the infamous Nights of Lights from November 19th through January 31st, from 6 to 9 pm each night. No reservations are required. Dec. 8th, 10:30 am & 7 pm: A Garfield Christmas Performance is at Thrasher-Horne Center. Tickets start at $19. Dec. 8th, 8 pm: St. Augustine Orchestra’s Annual Christmas Concert This annual Christmas performance is at the River House. Admission. Dec 9th, 9 am to 3 pm: First Coast Annual Holiday Arts and Crafts Show Browse handcrafted items, candles, artwork, and more. Do all of your holiday shopping and pick up unique gifts while supporting local artists. Free admissions. Dec. 9th, 6 pm: Regatta of Lights Lighted vessels take to the waters to show off their holiday spirit. This is a must-see for spectators and participants alike. Free Viewing. Dec 15th, 7:30 pm: St. Augustine Community Band’s Winter Concert An annual performance of holiday music. Admission. Dec. 17th, 7 pm to 9 pm: Las Posadas Del Viejo San Agustin This is a 400-year-old colonial Christmas tradition. This is an evening, torch-lit procession, which is a reenactment of Mary and Joseph’s search for lodging in Bethlehem. Located at St. George Street. Through January 6th, 4:15 pm Schooner Freedom Nights of Lights Sails This sail offers a breathtaking view of Nights of Lights from the water. The $50 per person rate includes complimentary soda, water, beer, wine and hot chocolate. 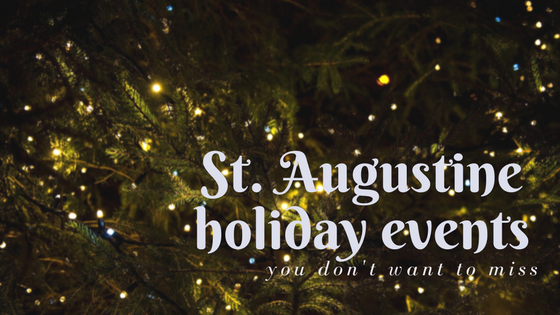 St. Augustine is one of the best places to spend your holidays! We hope you enjoy all of the festivities! All of us here at Beacher’s Lodge wish you and yours a very merry holiday season! 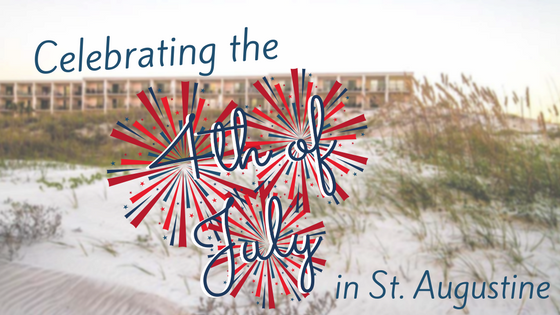 There’s something special about celebrating America’s birthday in St. Augustine, FL. Not only is it the first city of our great nation, but it is full of history and exciting things to do during the 4th of July weekend. First day, I would check-in to Beacher’s Lodge and hit the grocery store for fruit, burgers, hot dogs, lots of bottled water and maybe a few adult drinks, like Fresca. We all know that America loves to celebrate her birthday with burgers and dogs on the grill and lucky for us, we have charcoal grills here on the property for our guests to use. After I have stocked my fridge for the weekend, I would kick off my shoes and enjoy the view of the ocean and just relax before whipping up a quick meal. Second day of my 4th of July weekend has arrived and I would be up early as I want to watch the sunrise on the beach. Nothing beats a nice beach stroll first thing in the morning. Have you ever noticed how cool the sand feels between your toes in the morning? 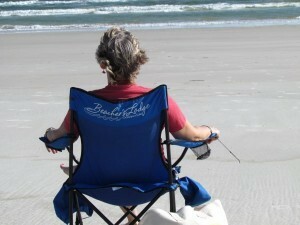 After eating breakfast I would grab my bathing suit, flip flops, sunscreen, floppy hat, beach chair and head for the beach. Naturally the rest of my day will be perfectly well spent in paradise as the ocean sings to me and I get a nice tan! That evening I would travel down the road to the historic district of beautiful St. Augustine. Strolling along the cobblestone roads is kind of like being in Europe as the architecture still shows signs of years long ago. In the historic district I would do a little shopping and try various foods along the way. To end my night I would walk along the bayfront and take in the view of the Bridge of Lions and all the boats in the river. Nothing beats this view as the wind blows through your hair and the lights dance off the water. The 4th of July has arrived and it’s all about relaxing and having fun! To celebrate the 4th, I would build sandcastles and rent a bike from Big Bill’s Beach Stuff, and enjoy a little bit of kayaking to make it a perfect day. After all, we all come to Florida to work on our tan, so being outdoors is a must. After a day of fun in the sun I’m ready to fire up the grill and enjoy a good ole fashioned 4th of July cookout, Beacher’s style! After enjoying a little dinner with friends and family we would head to St. Augustine to watch the Fireworks over the Matanzas. You can watch the fireworks from either the downtown historic district or you can watch from the southside of the Bridge of Lions. I personally prefer the area by the Bridge of Lions as it is not as crowded and yes, you can hear the music play. For those that love marathons, St. Johns Golf and Country Club hosts the Stars and Stripes 5K every fourth of July at 8 a.m., but I am like most of our guests which means I will start the 4th of July celebration with my toes in the sand. Well, Mother’s Day is just around the corner and what better way to treat her than a nice getaway to our beautiful Crescent Beach location at Beacher’s Lodge! With a balcony suite overlooking the beach, we guarantee you’ll be hearing the soothing roar of the ocean! Our beautiful white sandy beaches will wipe away all the stress from mom (and dad’s) daily life. Not one for sand between your toes? 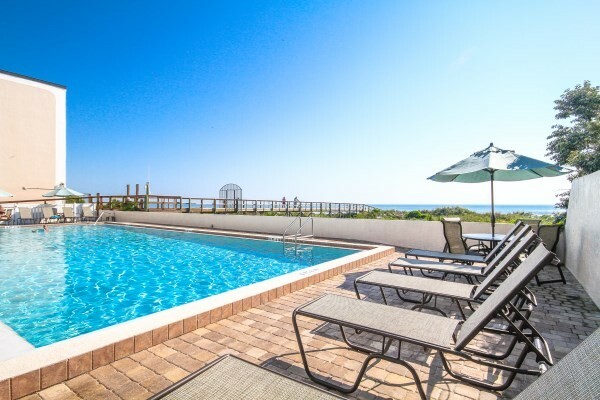 Beacher’s is also equipped with a 40 x 60 FT oceanfront pool! So this Mother’s Day, give your sweet mom a chance to kick back and enjoy a view! Maybe get here early for a long weekend and send dad off to the final days of the PGA Tour’s Players Championship located in Ponte Vedra Beach’s stunning Sawgrass golf club. Velofest and the Romanza Festivale will kick off Mother’s day weekend, so there will be plenty of events to make for an activity filled weekend. Make sure when you book your stay at Beacher’s Lodge, plan for a four night stay to qualify for our Pay for 3 Stay for 4 Special! If your plans don’t allow four nights, get your AAA, AARP, and proof of Florida residence ready for our 10% Discount! Beacher’s Lodge is located ten miles from downtown St. Augustine, so we are a convenient way to enjoy the town as well as having a quiet getaway! Stay for the weekend of May 8th – 10th and get out and experience Velofest. We are so encouraged by this event for bicycles, we want our guests to get out and make the best of Mother’s Day weekend. Kick off the weekend with a 7 mile race, $20 for advanced entry can win a purse of $500… regardless, a 7 mile ride along A1A is sure to be enjoyable. From adult to kids races, bike parades to mimosa’s for Mom, this is an event in Vilano Beach that the whole family is sure to enjoy. For more information or to register for the event visit the official website by clicking here. https://www.beacherslodge.com/wp-content/uploads/2019/03/beachers_lodge_logo.png 0 0 Shannon Lake https://www.beacherslodge.com/wp-content/uploads/2019/03/beachers_lodge_logo.png Shannon Lake2014-06-17 19:10:492014-06-17 19:10:49Become a friend on Facebook! St. Augustine is a city graced with many spectacular attributes. The vibrant culture, deep history, and beautiful sandy beaches are only a select few. 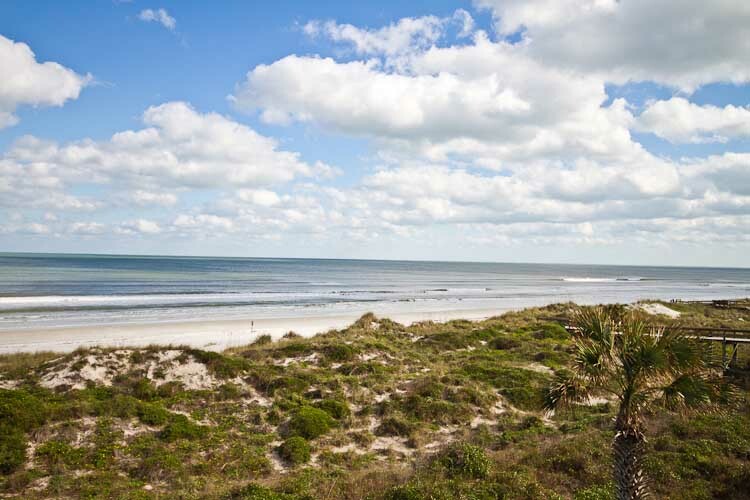 St. Augustine is a coastal gem, plain and simple. A gem which had not been for the brave explorers of the early seas would remain undiscovered. Throughout the centuries St. Augustine has evolved into the wonderful city that we here at Beacher’s Lodge Oceanfront Suites know and love today. This is thanks to those pioneers of the sea, St. Augustine is at its heart a coastal town, plain and simple. For hundreds of years countless numbers of marine vessels have visited our shores, from the grandest Galleons to the smallest dinghies. This October the St. Augustine Maritime Heritage Foundation is celebrating the inaugural festival celebrating the rich maritime history of this city. The festival begins October 25 and runs through the 27th and features live entertainment, a bar tending challenge, food, crafts, model boats, kid’s zone, dog agility, and finally a “quick and dirty” boat building competition and race! The Fountain of Youth Archaeological Park, 11 Magnolia Ave., will host the three-day Viva Florida 500 festival including The festival will be open each day from 8 a.m. to 5 p.m. Admission is included in the regular admission to the Fountain of Youth. Tickets are $12 for adults; $11 for seniors (60 and older); $8 for children ages 6-12; and free for children 5 and young. St. Johns County residents will ID also are admitted free. A VIP reception will be Friday night. Tickets for the VIP reception are $45. The festival is a fundraiser for the St. Augustine Maritime Heritage Foundation and will support the completion of the 16th Century Longboat Chalupa. Call 904-829-3168 or go to staugmaritimeheritage.org or www.fountainofyouthflorida.com. Visit us here at Beacher’s Lodge and celebrate the true nautical history of St. Augustine!